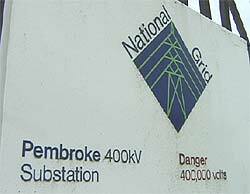 PEMBROKE, WALES, UK - On November 25, 2000 a few hundred residents in the tiny hamlet of Pembroke, Wales, were treated to one of the most unusual and innovative explosive demolition projects ever attempted. 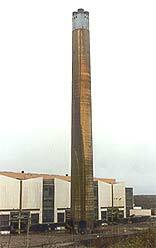 Situated along the country's west coast, where the Atlantic Ocean meets the Irish Sea, the Pembroke Power Station provided energy to the surrounding region for decades. A few months ago the plant began a modernization effort that included the demolition of many of it's most outdated facilities. 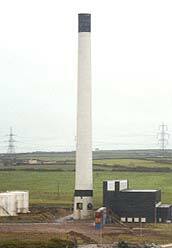 The removal of two massive concrete smokestacks, standing 350 feet and 725 feet respectively, quickly emerged as the most delicate aspect of the project, and prime contractor Brown & Mason brought in Controlled Demolition Group Ltd. (CDG) of Yorkshire, England to safely raze the towering structures. The 'easiest' of the two was the smaller 350-foot stack, which would require a precise drop into a narrow area between above-ground fuel tanks and an active generating station. 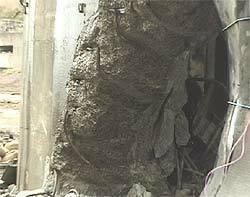 The larger stack, however, would challenge many of today's most established explosive demolition conventions. To start with, the stack was believed to be the tallest free-standing structure ever felled in Europe. It's 54-inch-thick circular concrete wall housed four independently-reinforced steel exhaust ducts which ran the full length of it's shaft, and the 66-foot diameter base tapered to 40 feet at its top elevation. But beyond these impressive numbers, the real challenge lay in the simple fact that there was no place for the stack to safely fall.